Many CCTV solutions provider build a CCTV system with advanced features to comply with the needs of the logistics operations. Not only will it provide efficiency but also offers an ease of use and better functionality. Thus, this must have a computing system that is also compatible with CCTV solutions. For these applications, an industrial computing device like the S17 rugged industrial PC has the most reliable system processor to ensure that it can perform its specific functions properly. Also, this industrial computing device can be integrated with the latest HD surveillance cameras and IP technologies. Now, can this device have the capability to provide a better image or video resolutions? Keep reading and know why it is a recommended computing solution for these applications in the logistics. Using CCTV in the logistics operations is an essential technology must-have. It helps the distribution operations to monitor and check its products as well as preventing other types of crimes. Likewise, logistics and distribution agencies require an advanced monitoring system within the operations. At the same time, specific applications can still be installed and utilised, even the latest versions of it. This makes the S17 industrial panel PC suitable to be used in the CCTV of the logistics operations. Not only it has industrial-grade components, but the S17 industrial computer also features a projected capacitive touchscreen. It bears an impressive touchscreen functionality allowing any user to utilise the CCTV operations. For instance, a user can zoom in a viewed image on the screen monitor through tapping or pinching gestures. In this way, CCTV controllers can have further view an image or video in a detailed manner. Most distribution agencies look for CCTV solutions that cannot only adhere its harsh working conditions. But, these agencies also wants a computing technology that can be integrated to the latest CCTV network. The most important function of an industrial computing device is to act as the Network Video Recorder (NVR). It should have the capability to record and store videos and images. Also, the industrial computer must offer an easier access to review these files when required as well. But, thanks to technological advancements. The S17 industrial PCs can perform this core function. As a matter of fact, this device has wireless capability. It does not require a router, Ethernet to connect to the internet. Therefore, it reduces space congestion due to too many wires and cables in the workplace. Undeniably, workstations for CCTVs have minimal spaces since only a few personnel can only access this place. So, distribution agencies have to make sure that this space should be utilised. The S17 industrial panel PC with a projected capacitive touchscreen has the options to fit in any spaces. This device can be mounted on walls as it has VESA mounting capabilities. What’s more, it can also have a thin client terminal setup. Hence, designing a CCTV system with industrial monitors is no longer a large, cumbersome task. It removes the need for space considerations. Despite the ability to be installed in small spaces, this computing device also requires connections to power supply and to the network. However, the S17 industrial PC has an array of LAN ports that can also be utilised. The LAN ports can be used with a POE (Power Over Ethernet) connectivity. It can negate the need for a fixed power source of the device in a CCTV network. Thus, this device can perform various application with low power consumption. Indeed, CCTVs have dramatically improved its surveillance technology. Its capabilities help in enabling distribution agencies to improve productivity and efficiency whilst on operations. Now, choosing the right industrial computer to the CCTV can be integrated to optimise its monitoring system. 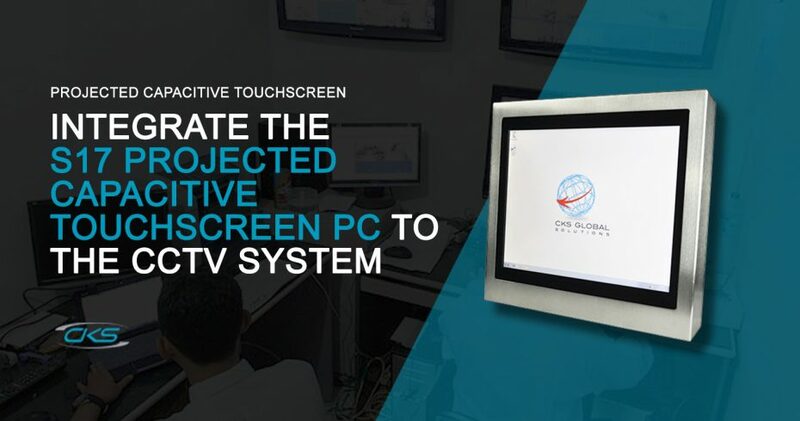 So, consider integrating the S17 industrial panel PC with a projected capacitive touchscreen in the CCTV system for logistics today.